The streets department maintains approximately 14 miles of roads which includes spraying for weeds, street sweeping, striping, crack repair & sealing, pothole repair, street sign installation & repair and removal of vegetation overgrowth to comply with our Sidewalk Obstruction Policy, scroll to the end of this page to view the entire Sidewalk Obstruction Policy. The streets crew is responsible for snow removal as per the District's Snow Removal Policy. Plowing normally begins after snowfall accumulations of 4 inches or more in depth. Most snow and ice control operations will commence in early morning weekday hours in response to anticipated peak vehicle trips. Our first priority is to keep the primary streets clear and open for everyone's safety. To view the District's Pavement Condition Index (PCI) please click on the links below. Stage One: North/South Sunridge, Mica, Haystack, Smoketree Ave., Plymouth Drive, Vista Grande Blvd. from Plymouth Drive to Jacks Valley Road and Silverado Dr. from Park View to Jacks Valley Rd. We ask that you plan your route accordingly. It is the District’s policy that property owners or their designee are responsible for removing snow and ice from sidewalks abutting their property. When 4" or more has accumulated, we will plow every street down and back to open the road up, once all roads have been opened and the storm has stopped we will begin widening all streets. There may be a certain amount of snow deposited in driveways or sidewalks during plowing regardless of whether they were cleared before the arrival of a District plow. We understand how upsetting it can be to residents who have shoveled their walks and driveways only to have the District come along and cover them up. However, our first priority is to keep the streets clear and open for everyone’s safety. The District office has received phone calls asking who is responsible for removing snow on sidewalks that are adjacent to our residential properties. The Nevada Revised Statute (NRS) below explains where the responsibility lies. NRS278.02313 Maintenance, reconstruction and repair of sidewalks: Circumstances under which governing body may compel action by owner of property. Except as otherwise provided in subsection 2, a governing body shall not require an owner of property to maintain, reconstruct or repair a sidewalk in a public right-of-way that abuts his or her property. The repair and reconstruction of a sidewalk in the public right-of-way that abuts the property of the owner if the owner caused the need for such repair or reconstruction. The general maintenance of a sidewalk in the public right-of-way that abuts the property of the owner, including, without limitation, sweeping, removal of snow, ice and weeds, and maintenance of any grass, shrubs or trees that encroach on the sidewalk. Snow is not to be deposited in the street per county code 12.08.040, if you are using a snow blower or plowing you must keep the snow on your property when using these removal efforts. In an effort to assist our neighbors and to speed the process in shoveling the snow off of sidewalks, we are willing to allow snow being shoveled from sidewalks only, to be placed in the street. Please try not to impede the flow of storm water in the gutter as it melts. We would also like the sidewalks to be cleared within 24 hours of the storm passing through. To view the entire snow removal policy scroll to the end of this page and click on the link. The District contracts out some services such as construction of ADA compliant wheelchair ramps. 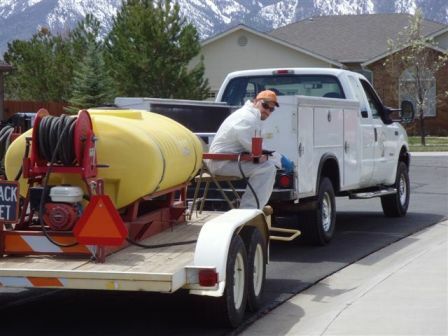 Other contract services are roadside crack, curb, gutter and sidewalk replacements. 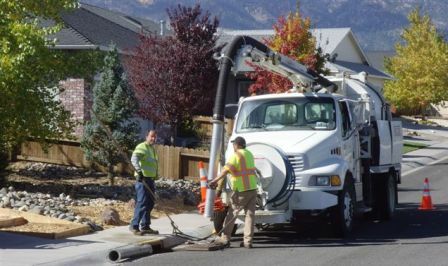 Cleaning Storm drains with Vacuum Truck.